Blackinton B764 Canadian Badge - B764 - 1 5/8" x 2 1/2"
Home > Blackinton > Police Badges > Canadian Badges > B764 Canadian Badge - B764 - 1 5/8" x 2 1/2"
B764 Canadian Badge - B764 - 1 5/8" x 2 1/2"
Blackinton B764 pays homage to our close friends and neighbors to the north. Decorated with a beaver so synonymous with the Canadian ecosystem, this badge is perfect for a park ranger, campground security or the DNR. This Blackinton badge lets the world know that those who wear it are there to keep the camper, fisherman or hunter safe and secure while in the great outdoors. 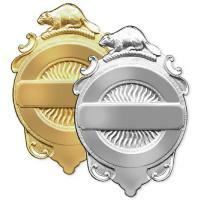 This Canadian badge comes in both gold and silver. You can count on quality craftsmanship and materials that will last for years. Please allow 4-6 weeks for delivery. ©2002-2019 CopsPlus.com: Blackinton B764 Canadian Badge - B764 - 1 5/8" x 2 1/2"